This is a shot out of my office window this morning. I’ve converted the back bedroom into a workspace and use the cab over space to sleep in. Even though I haven’t dated for three years, irony would have it that I would meet a wonderful woman three weeks before I was to leave S. Florida. Yesterday I was telling my friend Mary – who is going to kill me when she sees this – that lately I have been feeling very Solid. “Solid” is the way most people feel most the time, but for me, it’s miserable. 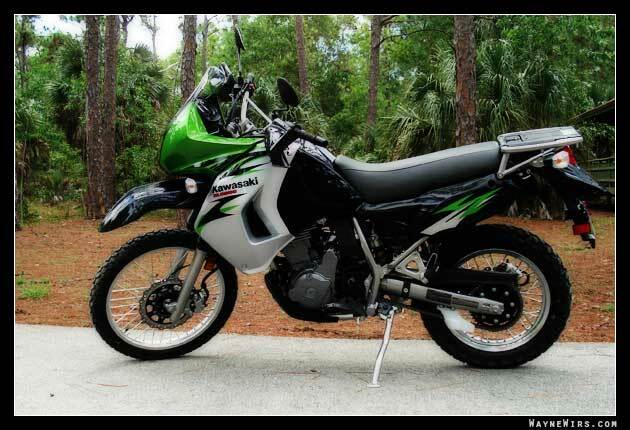 I took a bit of a risk buying a KLR-650 motorcycle, not knowing beforehand if the RV would be able to haul it. Almost everything I read online said it couldn’t be done. What to Keep. What to Throw. What to Give Away. What to Stow. In less than three weeks, I’ll be living in the RV full time. Rather than try to sell all my stuff, I’m giving nearly everything away. That’s not a problem. It’s my books and photos that I’m having a hard time with. Over the last week I’ve been making preparations for what I am calling Act IV of my life – which I plan to start on August 1st, 2008, when I drive off in my RV to destinations unknown. After driving all around South Florida on Tuesday, I found three RV’s that I really liked: The first, a Coachmen, was newest and looked the nicest, but I didn’t trust the salesman. The second (a Four Winds) and third (a Tioga) were about even in quality, but the Four Winds had more extras thrown in. The Tioga, was the very first RV I came across when I started my search online over two months ago. Ironically, it is also the same model as the RV used by the guy who got me thinking about going mobile in the first place: The Adventures of Tioga and George. Picked up delivery of my new motorcycle yesterday, a dual-sport model which has both on-road and off-road capabilities. A 2008 Kawasaki KLR-650.